The marathon was two days after Josh’s birthday and one week before the anniversary of his death. I’d packed Lara bars, sports beans, and a bag of toasted white sesame seeds, which Josh put on everything and now I do, too. 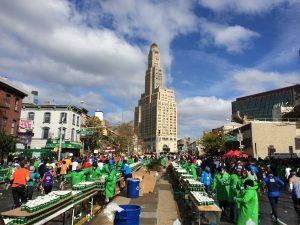 It was a stunning day of sunny blue skies–no garbage bag poncho needed. I usually run with headphones, but there was such wonderful people watching, music, and fanfare that I didn’t miss my music at all for the first half of the marathon. The first stop was at 4th Avenue and 8th Street, where my friends Mackenzie and Jared had come out to cheer with the two little boys they were babysitting. All four of them were holding signs. I hugged them all, including the two little boys, who were not so into hugging a sweaty stranger, but my enthusiasm could not be contained. 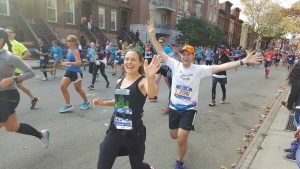 I met Mackenzie at my first race, the freezing Joe Kleinerman 10K in January 2012, riding the subway up from Crown Heights to Central Park. We’d stayed close even after an injury prevented her from running. In the 4 years since, I’d seen her marry Jared, and now, five months pregnant, she’d stood out in the cold to cheer for me. Stephanie and Erwin were at Lafayette and Claremont, Erwin holding up a massive blackboard sign. Right after Josh died, a friend from London, the wonderful Brenda Lyons, connected me to Stephanie, who’d recently moved here from London. Brenda thought we’d make good cycling partners and, likely, that it would be good for me to get out on some rides. While Stephanie’s a far more serious cyclist than I am, we rode to Nyack together. I told her about Josh and she told me that her boyfriend Erwin, an even more serious cyclist and tri-athlete, had been recently diagnosed with PSC. Given the rarity of PSC, it was a startling connection. Even more impressive was Stephanie’s story of how Erwin’s diagnosis had inspired them to uproot their lives and take huge career risks to move to New York. We’ve had wonderful adventures and conversations ever since. We were so worried about not finding each other that when we did, we went in for a double hug. Stephanie and Erwin not only cheered me on, but took me out for a celebratory dinner. Stephanie and I laughed about how our hug felt like we’d crossed an ocean to find each other. All of my marathon hugs felt like that. There was–again–that heightened sense of connection that I felt in the wake of Josh’s death. 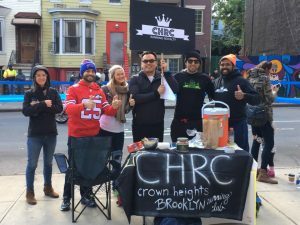 The awesome CHRC cheering squad was at Mile 9. 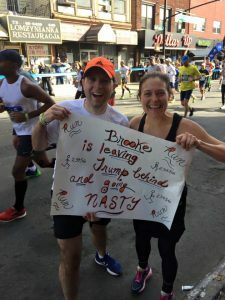 They speed-inked personalized signs when they saw Sebastian and I approaching on their marathon apps, showered us with cheers and high-fives, and captured our dorky euphoria on film. Jason, Josh’s best friend, whom I’d cried with when Josh was dying and stayed close to after he was gone, popped up out of nowhere on Bedford Avenue. Jason hadn’t told me he was coming and it was a miracle that he found me. Especially, he pointed out later, as I was wearing “all black with a strip of masking tape.” An artist good at making things, he said, “Next year, I’m making your name tag.” I hugged Jason, the best surprise and Where’s Waldo Winner of the marathon, and then Sebastian and I were off. My mom, stepdad, and sister were at Mile 12. My mom and stepdad flew in from South Texas, my sister from London, to spend the weekend carb-loading with me and to embarrass me with signs like, “Run Brookster the Hipster”. Sebastian and I posed holding a poster that read, “Brooke is leaving Trump behind and going NASTY!” Sebastian, in his saintliness, waited for probably 5 minutes while my mom got a stranger to take multiple mother-daughter pictures. My sister, who’d sailed through last year’s marathon, guided my parents around Brooklyn and Manhattan, to meet me at Miles 12 and 25. My stepdad has Alzheimer’s and it was a lot for him to run around the city like that. My sister took a red-eye back to London that night and had to work the next morning. Sebastian doing all of the pacing while I rode in the sidecar, blowing kisses at the crowds, worked out great for me until Mile 18 when a bathroom stop became immediately mandatory. Having PSC means having stomach problems. It can mean a lot more debilitating things, but I’ve been very lucky. “Keep going–good luck!” I called to Sebastian as I frantically climbed over the barricade and ran into Le Pain Quotidien. My legs were shaky, but spectators helped me over the fence. A policeman waiting in line for the bathroom let me go first. Until this point, Sebastian and I had smoothly hit or beat our goal of a 10-minute mile. Even with all of my hugging delays, Sebastian would continue on to a brilliant finish, beating his previous year’s time and his goal for this year. I was so proud of him.